Valerie Crumbley, an administrative assistant at Grace Brethren International Missions, and her business partner, Katie Elder, were featured in today’s (February 20) Fort Wayne (Ind.) Journal Gazette. The two have teamed up to create Friendship Foods, which provides cooking consultation. 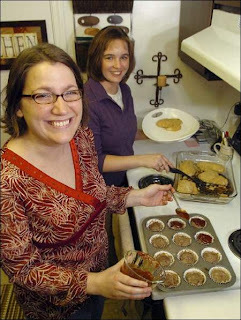 In the photo at right, Katie and Valerie show their Favorite Meat Loaf Cups and Rosemary Oven Fried Chicken (photo by Dean Musser Jr., The Journal Gazette). Read on to learn more about this dynamic kitchen duo. You know the routine. In fact, you know your mealtime routine so well it has become dull and mundane. If that’s your situation, two northeast Indiana women believe they can help turn things around at your dinner table. Fort Wayne resident Katie Elder, 27, and Valerie Crumbley, 31, of Warsaw, will present Neighborhood Connection’s latest cooking course: Friendship Foods: Meals in Advance. The two own Friendship Foods, a cooking consultation business. Friendship was created when these formerly “kitchen-lost moms” had trouble preparing food for their families, according to their blog, http://www.friendshipfoods.blogspot.com/ . After much trial and error, they came up with a solution that virtually anyone can use. Their program provides guidelines for cooks to prepare quick, economical and healthy meals on a budget. Crumbley, mother of a 4-year-old daughter, Lauren, and administrative assistant at Grace Brethren International Missions, and Elder, a stay-at-home mother who home schools her 5-year-old daughter, Selah, have worked together as cooking consultants the past three years.